What is the difference between Nickel and Copper? 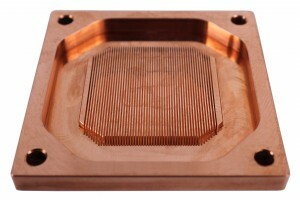 All water block cooling heads are made of bare rods of electrolytic copper. These rods are milled using a precision guided CNC machine to make a bare copper water block (cooling head) base. Nickel electroplating is a technique of electroplating a thin layer of nickel onto a metal object. Nickel plated water block means the product is coated with a fine layer of nickel after milling. The bare copper bases are therefore given a fine thin layer of nickel coating in a submersion bath. The nickel layer is decorative and can provide corrosion- and wear resistance. So-called ‘Nickel water block’ is still a pure copper water block, but plated with a layer of nickel. Performance-wise nickel plated water block is identical in performance to non-plate (bare) copper water block. What is a Full Cover (EK-FC) water block? How to clean water blocks?